How many of you first gen guys are running an aftermarket lift pump like Fass or airdog? I'll be pulling my injection pump off to fix a few leaks that have showed up recently, and figured I might install a new fuel delivery system while I'm at it, as the old system is in dire need of an upgrade. Any thoughts/opinions would be greatly appreciated! Can you see a noticeable difference in terms of fuel pressure/delivery with that upgrade j.fonder? I initially leaned towards fass/airdog due to the fact that it bypasses all factory fuel lines, which have seen better days on my truck. Did you by chance upgrade your fuel lines along with the pump upgrade? well in this setup you're replacing the line from the lift pump to injection pump. if your fuel lines are bad, you'll have to replace them whether you use the piston pump or fass. meaning you can run a new line from tank to piston pump just as easily as you can from tank to fass. i still have factory lines from the lift pump to tank. i do however drill my banjo bolts slightly larger whenever i remove one. not sure it helps, but i figure why not. if you like spending money and relying on an electric pump, then go with the fass. but for 1/4 the cost, better reliability, and more fuel than you'll ever need, i'll stick with the piston pump. X2 Fass electric pumps being a waste of cash and time on a VE pumped 12V. Install the piston lift pump would be my call as well, as pictured above by j.fonder. I hate spending money, especially considering I have a tight budget between my truck and paying for school, so thanks for bringing this mod to my attention. Really all I am going for is reliability, and it sounds like this piston pump has been pretty good to you. Top end fueling is definitely something I would like to increase, I just figured I would look for ideas in terms of fuel system upgrades while I had my pump off. Is the piston pump pretty easy to install in general? Thanks Oliver, in doing some more research it seems as though a majority of guys prefer that piston pump. 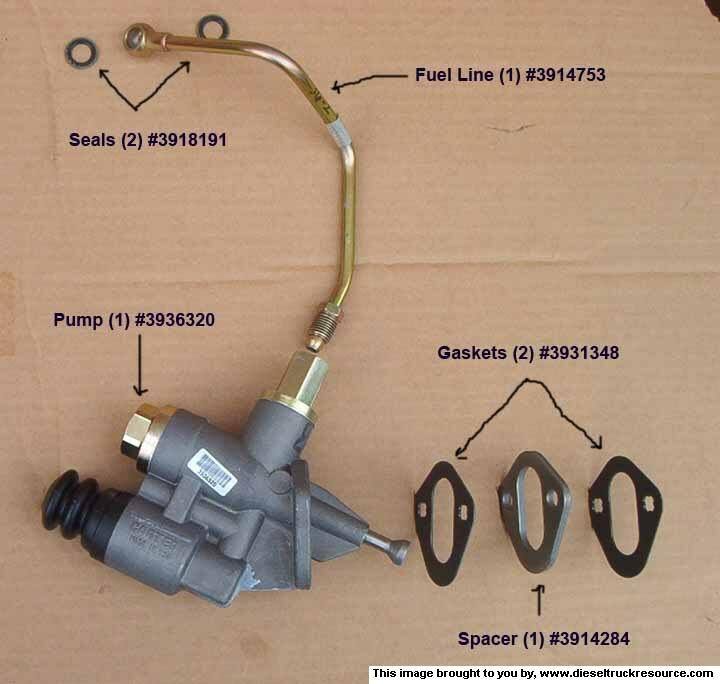 They supply more than enough fuel flow and pressure for a 1st gen. They are also pretty cheap and I have seen them go 250,000 miles dozens of times. Fass / Air Dogs electric pumps are neither cheap or that reliable. I have gone through three Air Dog electric pumps [it is ready for another judging from the groaning it is making] in 130,000 miles on my 24V '01. I have never had an electric fuel pump on anything that was reliable. Vader93, what did you go with as far as your fuel line goes? There are so many options, was just curious what you installed. been very pleased with my hungry diesel piston lift pump.